The 2012 Spanish edition of NFPA 1: Fire Code improves your ability to ensure occupant safety with added mandates for sprinklers in all new buildings three or more stories in height and CO detection in new residential occupancies, as specified by NFPA 101: Life Safety Code. This edition also requires floor fire protection for new non-sprinklered one- and two-family dwellings. In another important change benefitting fire and life safety, the Code specifies that two-way radio communication enhancement systems may be required by the Authority Having Jurisdiction (AHJ) per provisions in NFPA 72. 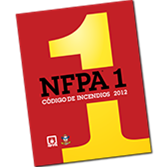 The 2009 Spanish edition of NFPA 1: Fire Code introduces the Code's new title and increases the amount of practical guidance available to users. Instead of listing references, this edition of the renamed NFPA 1: Fire Code provides extracted text addressing interior finish, contents and furnishings, and dust control requirements for industrial hazards. Fire flow requirements have been moved from the Annex to the body of the Code to ensure consistency among jurisdictions. New requirements address motion picture and television production work done on location, away from the main studio soundstages. Three new Annexes provide information and guidelines for fire fighters and other emergency responders, to help improve community and fire fighter safety. The 2006 Spanish edition of NFPA 1: Uniform Fire Code™ adds critical information through new chapters. New Chapter 6: Classification of Occupancy defines occupancy classifications to enhance your understanding of requirements and improve compliance and enforcement. New Chapter 32: Motion Picture and Television Production Studio Soundstage and Production Facilities works in conjunction with NFPA 140 to provide a minimum level of fire and life safety on the sets of these activities. New Chapter 33: Outside Storage of Tires includes provisions to keep tire storage safe from all potential sources of ignition. New Chapter 34: General Storage presents provisions that apply to indoor and outdoor storage of materials representing the broad range of combustibles.